A very healthy change to the normal meat and oil based sauces, a little tangy, but you will be amazed at the flavors. Try the homemade pasta with this as well and you will have a gourmet meal fit for a King! The herbs and spices blended together make a wonderful spread on Italian Bread or a great sauce! Combine all ingredients in the work bowl of a food processor fitted with the steel blade. Process to a fine paste. Taste and adjust seasonings if necessary. Serve over hot homemade pasta noodles or spread on Ciabatta Bread slices and broil. Makes about 1 cup. I enjoy using basil on a regular basis, and grow basil in an outdoor garden, you may want to find a way to keep the basil fresh for longer than just the summertime, living in Florida or warm climate is an advantage. But there are ways to keep this beauty and preserve its freshness. Freezing the basil is an excellent way to do this. Not only will it keep it fresher than dried basil, you are able to keep it for longer periods of time. There are many recipes that call for fresh basil as opposed to dried basil, so you may want to consider freezing some to have on hand when your recipe calls for it. Before freezing the basil make sure that you wash the leaves thoroughly. Just like drying basil, there are many ways to freeze basil too. Basil is a delicate leaf that can be ruined easily so you want to take caution in finding a way that works best for you. The first recommended is to place your basil in an ice cube to be frozen. You should take about 1 teaspoon of basil and add it to unfrozen water in your ice cube trays. You can then freeze several of these until you're ready to use the basil, just take out the ice cube and add it to whatever recipe you are making. The water will evaporate, leaving just the fresh taste of fresh basil to spice up your recipe. This works especially well with homemade stews, sauces and my Italian Style Traditional Sunday Sauce. Another popular method is to throw the leaves into a food processor with enough oil to make a thick or thin paste depending on your taste preference. You then put the paste in seal a meal bag and place them flat in the freezer. When you are ready to use the paste you can break off a piece and put it into the recipe. You would want to use this for dishes that have some form of liquid in it, such as a sauce, stews, casseroles, soups, or salad dressings. This is also a wonderful way to keep pesto on hand when your in a hurry. You can also just let it thaw and remove the basil from the oil to add to your recipes. Another basic method for freezing basil is by placing it on parchement paper onto a cookie sheet and putting it in the freezer, my mom use to use this method all the time. After they are completely frozen you can take the leaves and put them in a seal a meal bag or something air tight like a freeze bag. Freezing basil works well and there is no waste. I've got to do homemade pasta, this would be so perfect with it. I love pesto idea, last week (after a quite long time) I prepared some pesto. Definitely I will do some more, as spring came and summer approaches. Looks tasty, great tips too. My sister used to grow basil and freeze fresh pesto. Good times. Basil pesto sounds awesome with homemade pasta! I have fresh basil growing in my herb garden. Now I know what I will be making for dinner tonight. Thanks. In the summer I freeze pesto for the entire year. Looking forward to pesto season with spring! Basil is everywhere. 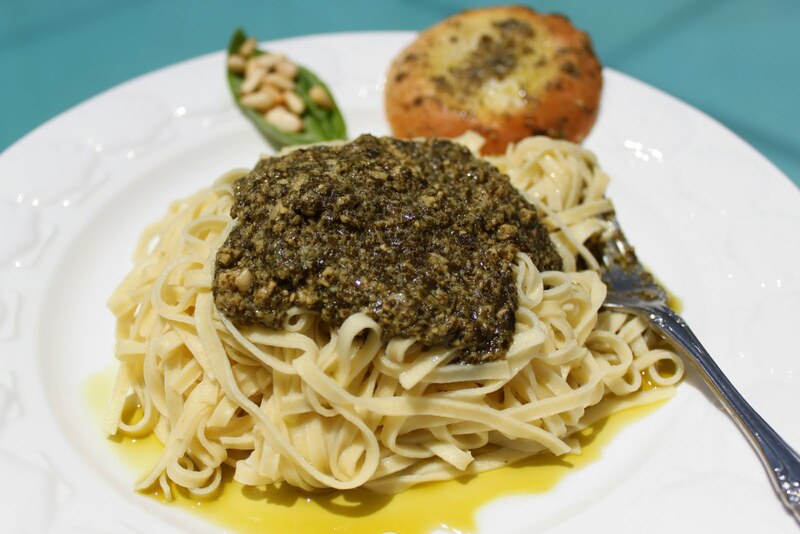 Pesto nights...yours is perfect! what's better than the fresh smell of basil and parmesan? I never made it with addition of parsley though, that's a great idea! You have all my favourite ingredients in your pesto. It must be very delicious with pasta. Homemade pasta + homemade pasta = great dish! Basil pesto is one of my favorite sauce! Mmmm, is there anything better than the smell of fresh basil? It is seriously intoxicating. I didn't know you could freeze it! Thanks for the tip! This is one pasta that pretty much anyone loves. The warm smell of the basil is enchanting. As simple as it is, it is a recipe worth mastering and I think every good cook should know it. Yours looks wonderful and reminds me I need to make some of my own very soon. This is really wonderful!! What a wonderful recipe! I have made my batches of pesto for winter storage. YUM! I could drink this! One of my most favorite sauces - especially with fresh basil right from the garden. Delish. I love it. Amazing. The basil ice cubes sounds like a great idea. I imagine the water helps preserve the color? Thanks for the post, Claudia~!